I have always liked this idea – it is unique, based on what you make it, and definitely personal. Couple years ago, I did that, using my own – and now pretty much famous – chocolate chip cookie recipe. 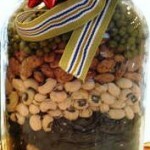 I participate in one Christmas Bazaar a year – and every gift jar with the chocolate chip cookie ingredients sold out! All I can add to that is that I wish days would have twice as many hours, so that I could make everything I think is a great idea! 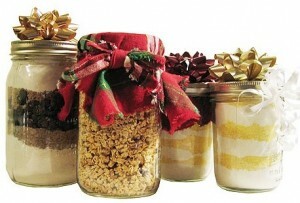 Here I am going to tell you how to make these jars and really – what you put into them is up to you! And of course – I will be including some creative recipes and will add more in time for you gift giving – keep watching this website regularly or sign up to get updates automatically! Choose the right kind of container – and make sure the lid is tight fitting to prevent spillage. The best ones are canning jars, either 1-pint or 1-quart they are wide mouth and easy to fill. Make sure you wash all containers thoroughly and dry them – any moisture left in the jar will likely spoil your efforts. To make sure that all ingredients fit, pack each one down real good before adding the next layer. You can do this using flat bottom glass and pressing down on in the last ingredient firmly. If a jar needs to packed lightly, tap it gently on the table to shake the ingredients down. If your recipe needs bagging some ingredients, use resealable plastic bags and be sure to press out all air from the bag. Your layering order are up to you – just follow a few simple rules: powdery ingredients, such as flour, should be placed at the bottom so they don’t coat other ingredients. If you pack them down the right way, they won’t mix together. Coarser ingredients, such as brown sugar can go next and finally those consisting of larger pieces – such as chocolate chips, cereals, etc. Seal the jar tightly so the ingredients won’t shift. If you are planning to make more than one of the same type of jars, make one first to see how much you need to pack the ingredients. Make you gift tags – and decorate your completed jar by either just tying a ribbon with the gift tag or cutting out a round piece of festive material to place over the top of your gift jar. Make sure you leave enough edging to make it nice and festive looking. You will also want to include recipe card with your gift jar – either by tying it with the gift card and attaching it to the jar with a piece of ribbon. 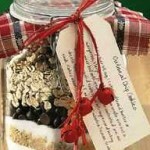 I have also done it by neatly folding the recipe and placing it into the jar with your ingredients. 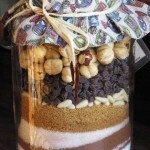 Another good idea is to add wooden spoon, spatula, set of measuring spoons or any other decorative element to the jar. Hope you have enjoyed getting this information, please send in your comments., suggestions and experiences, your input is always welcomed and very much appreciated!